BY NADINE JAMES-WARD – Today, the Blue Cross Blue Shield Association released its annual Investing in America’s Health report detailing the efforts made in 2015 by all 36 independent Blue Cross and Blue Shield companies and their foundations to improve healthcare quality and affordability in the communities they serve. Combined, Blue Cross and Blue Shield companies invested nearly $350 million in community health initiatives in 2015, and employees volunteered nearly 400,000 hours and gave more than $10 million in personal donations. Blue Shield of California and Blue Shield of California Foundation are investing in America’s health with a long-standing commitment to ending domestic violence. 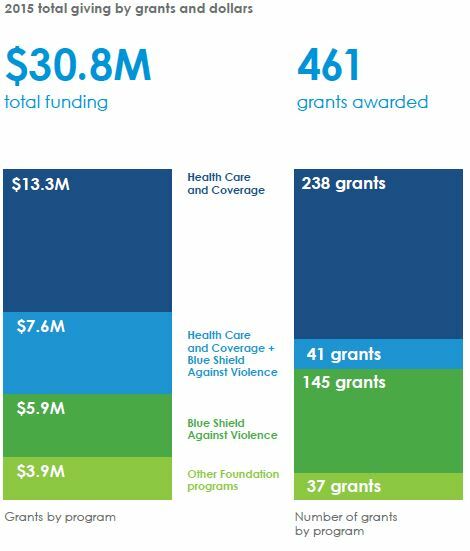 Blue Shield of California Foundation is the state’s largest private funder of domestic violence services and prevention. Last year, we invested more than $13 million in domestic violence service providers in California, ensuring that essential services are available to those in need. In 2015, Blue Shield of California hosted a “Road Show” in six locations to promote local domestic violence organizations and provide a safe forum for discussion and support. As a result, more than 3,000 Blue Shield employees took the “No More” pledge. Many also took advantage of the company’s 2-to-1 match for donations made to domestic violence nonprofit organizations. The parent company also launched a workplace domestic violence policy, supporting affected employees and training managers to recognize and support employees who may be experiencing violence at home. Blue Shield of California and Blue Shield of California Foundation are not only committed to ending domestic violence, but improving the healthcare safety net as a whole. The Foundation is focused on improving the lives of all Californians, particularly the underserved, by making health care accessible, effective and affordable. To learn more about how Blue Shield of California and Blue Shield of California Foundation are creating a healthier California, see our 2015 Mission Report. Nadine James-Ward is corporate citizenship manager at Blue Shield of California.